Who doesn't love Elmo and Cookie Monster? And who doesn't love cupcakes? So when I first saw Elmo cupcakes on justJENN last year, I made a mental bookmark, as well as shot my sister an email to find me some red sanding sugar in LA. (Where to get it? Surfas in Culver City is a good place to start, or their online store.) I guess when she spotted the perfect blue for Cookie Monster, she bought that as well for me to bring back to Taipei, as well some white chocolate chips and smaller chocolate chips. So when there was a chance to make them for an Elmo lover this past spring, I put my handiwork to the test. The steps are fairly straightforward- you just need to do some prep work for the eyes and mouths before hand. And for Elmo's nose, I used some marshmallows I had and cut them into shape.. Otherwise you could use orange jellybeans or soft candies. 1. First, let the baked cupcakes cool down and frost them! Use vanilla or cream cheese frosting as I tried it with chocolate at first and the colors came out too dark. (See the first picture of the two pairs! The top is with chocolate frosting and the bottom with cream cheese). 2. While the cupcakes are cooling, pour the sanding sugar into two plates so you can dip the frosted cupcakes onto it. Also, cut off the nibs of the chocolate chips and use frosting to "glue" the chocolate onto the white chocolate. You could also use marshmallows for the white of the eyes. I also tried using a food coloring marker I had bought, but it didn't work as well. Then take apart oreo cookies and break each side in half. I scraped off the cream, but I guess you could use that as "glue" as well. For Cookie Monster, have the eyes be off center and in different directions. 4. And you're ready to party! 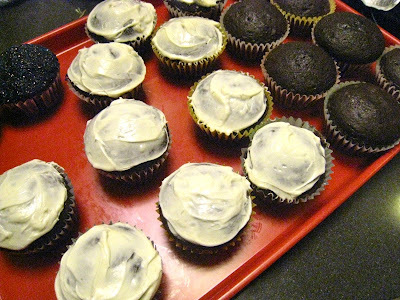 One thing is to be patient and be sure to let the cupcakes cool down completely. I think I rushed some of them and they were still not totally cool and the next day the sugar had sort of melted and some of the faces slid away from what they were supposed to look like. :( Or the humidity in Taipei. Or don't cover and seal them like I did in the cupcake holder until you're ready to go. But we stuck them in the fridge for a little bit and the cupcakes were still a hit and though quite sweet with all the sugar and chocolate, super cute! Nothing like a warm bun on a rainy day... or a whole bagful. At this tiny mantou shop on Yanji Street, not too far from Mei Kung Thai Restaurant, you can pick up pillowy, soft steamed buns in different flavors and sizes. The larger ones run about NT$20 and are served warm, while a bag of these mini ones is NT$70, but served room temperature. The combo pack includes Chocolate and milk mantou and brown sugar and milk mantous which definitely are on the sweeter side. I've never seen them swirled like this at other places, like on Lane 216, so I had to try them and since they were not sold individually, I got a pack. I liked the size and the flavor, but the sweetness left a slight aftertaste that the regular brown sugar mantou did not. I wish I knew what some of the other mantou flavors were, but the signs are only in Chinese and I could only guess from what was in the steamer and from my experiences with other places. The business card says they've been in business for over 60 years, so you know they are doing something right! Kid friendliness: high chairs available. This is the entrance to Shintori- People Shadow 3. "You have to throw a rock." So of course, we tried throwing the rocks that littered the ground at the door. There was evidence of previous customers who tried the same- grey dents and scratches on the seemingly impenetrable door. And then the door slides open and we entered a spooky hallway- the door at the other end didn't open until the one behind us shut. Has it ever been so much work or fun to go into a restaurant? I could see how it would be amusing to bring someone new and watch them try to figure out how to get in. Once inside, you'll notice that the restaurant splits into two parts- People and Shadow 3. People serves Western food and is set up like a lounge bar with lots of sofa style seating. Shadow 3 serves Japanese fusion and is a distinctly modern restaurant space, once your eyes adjust to the darkness. Plus the lighting at the tables focused on the table space, so you could see the food and it wasn't so dark once you were seated, unlike Mitsui which actually feels so dark in some areas that I can't see what I'm eating! We were there for an early dinner, so it wasn't crowded at all. I could imagine this would be a place where lovers rendezvous with its shadowy corners and lack of people. But it was an equally nice place to eat with the family. First course was like a bite of fancy canned tuna on a bed of onion. Third course- sashimi was good and very fresh. I missed my uni I usually get at Sumie. Fourth course- baked bamboo and crab leg were both very sweet. Fifth course- uni steamed egg was the favorite dish of the night with the silky chawamushi having lots of hidden goodies under the surface of the steamed egg. Seventh course- but then there's cold udon noodles. Instead of served in a pile on a plate as usual, it was in a light broth with citrus flavor. It was refreshing and a palate cleanser of sorts. Last course- dessert plate included fruit, tiramisu mochi and ice cream. I haven't been back since last year (yes, this is how backlogged I am on posts! ), but I would definitely go back and try it again. I'm curious also how the other locations compare to this one- I think all the Shintori restaurants have different atmospheres and themes. Kid friendliness: great setting for large groups, spotted kids/babies every time. highchairs and kid dinnerware available. 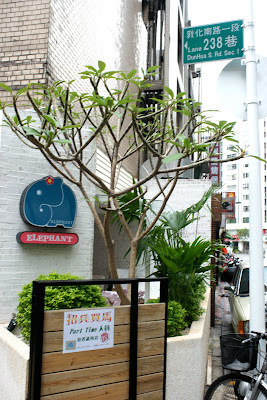 Elephant is a cozy cafe behind Dun Nan Sogo that you might never spot, next door to the now closed California Grill. But it's worth visiting especially for its weekend brunch or grabbing one of their patio seats for afternoon tea. The weekend only brunch includes a hearty, homestyle breakfast plate that you can customize to include the amount of meat, the style of egg and the kind of potato (hash brown or home fries (NT$220-320)). Although it was a little strange to have small sides of potato salad and salad on the plate, it was not a bad thing. A small side of fresh fruit comes on the side as well. I had to try the cheesecake as well- which was milky and creamy. Not too sweet, with a strong cream cheese flavor. Lunch options include sandwiches, pasta, rice dishes and daily specials. I enjoyed the sandwiches with the crispy french fries, especially the egg salad sandwich (NT$!50). The egg salad sandwich doesn't have a lot of mayo mixed in like you would expect, which works for me because I'm not crazy about mayonnaise. I also was surprised by their lasagna which was not heavy at all. Loaded with vegetables, along with layers of pasta and cheese, this was one of the most memorable tasty lasagnas I'd had in awhile. But I visited again recently, and now instead of offering one type of lasagna, they offer several. I ordered the vegetable lasagne hoping to get the same thing, but now it came with a creamy white sauce and green pasta layers. It was different than what I expected, but worked. So if you are set on tomato sauce, check with the server. I didn't like their daily special curry with rice which was way too spicy for me and more soupy than a thicker curry I was used to. This is no longer on the menu as well, I believe. Other things to try at Elephant Cafe are their waffles and their chocolate peanut butter dessert. Elephant gets busy during the weekends, so call ahead for reservations, especially if you have a larger group. The last time I went to Toronto was a few years ago in 2007 and I can barely remember what I ate- bar food, hotel food and some expensive dim sum. Oh, I did make it to Mother's Dumplings in Chinatown, but everything else is mostly a blur. So this time when I went last month, I was determined to eat up a storm in Toronto. Thanks to Yelp, awesome readers from my Facebook page (thanks guys!!) and more food blogs than ever to research from, I had lots of new flavors and a shortlist of places to eat at if I ever go back to Toronto again! Of all the spots in Greektown on Danforth to choose from, we headed straight to Messini, which was the only one that still packed a crowd at 4pm in the afternoon. The above picture should say it all- a huge pita stuffed with lamb, tomatoes, tzatziki and then french fries!!! I've never seen that before elsewhere, but man was it genius. When I ordered the gyro sandwich, the waitress asked if I wanted pork, chicken or lamb. When I ordered the lamb gyros pita (C$5), she warned me it would be more fatty than the other meats. I was a bit confused, but I understood why after eating it. Unlike many gyro places where the meat is ground up and processed into a slab and then sliced into strips from the spit, the lamb here was real chunks of roasted lamb, stringy and browned, reminding me of carnitas. If you don't like lamb, then order chicken or pork because the lamb here is quite strong in its smell and taste. The other thing I couldn't resist was the greek fries(C$3.95) which were fried rounds of potatoes topped with feta cheese. The servers are quite busy running around, so you will have to work to wave them down. But once your food comes, you should definitely leave full. I probably wouldn't have eaten here if I didn't have food and beverage credit from staying here, but their food is solid. The creamy Sweet pea risotto with scallops (C$17) had huge, perfectly seared scallops and the great flavors. Their eggs benedict were quite nice too. The feel of the hotel and restaurant are a bit old school, but it's amusing to admire their walls of headshots of celebrities who have stayed there. 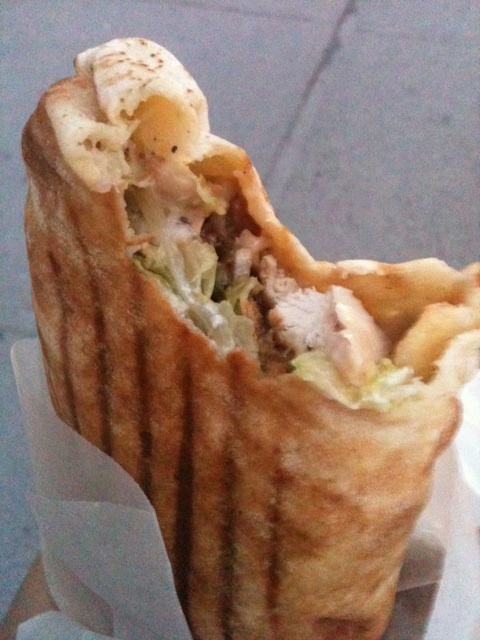 The chicken shawarma from Wrap and Grab was hands down one of my favorite meals on this trip. It was strongly recommended to me by reader Vicky, so I knew I had to give it a try. It was my first time trying shawarma, though it reminded me a lot of Doner Kebab in Taipei, this was so much more. Along with the meat and lettuce, you can also add garlic sauce and hummus which gives it a creamy, zesty flavor. The flavors seemed to have melded together when they heat it up, and the effect was like a super long wrap in a pressed panini. Wrap and Grab has two locations and there are a ton of shawarma places on every other block, all over downtown, but I'll never forget my first time. Just don't get tempted by the samosa- even after toasting, it wasn't crispy or good. Reader Olivia strongly told me to try out Fresh so that I could understand what she was looking for in Taipei- sorry Olivia, I'm not sure there's anything like it here! Fresh offers a completely vegetarian/vegan menu with salads, appetizers, wraps, burgers and fresh bowls. Fresh was completely packed when I stopped by for dinner, but it was about a 10-15 minute wait for four people. My favorites included the cornbread and hummus (C$2.50) and gluten free cashew cookie. Appetizers included quinoa coated onion rings, (C$5) veggie egg rolls (C$8) and sweet potato fries (C$6). I'd choose the salads over the soba, which varied depending on what sauces and toppings you mixed in. The Fresh bowls are quite expensive, at about C$9-13 for brown rice and C$14-15 for soba noodles. We tried the chopped caesar (C$8) which had crunchy tempeh, edamame, sun dried tomato, jicama, red pepper, napa cabbage, pine nuts and salad greens. If you're hungry, go for the dinner set at C$21, which includes a small appetizer, smoothie, fresh bowl and cookie. If you're going to go for dessert, definitely pick the cashew cookie over the chocolate chunk, which was a bit dry in comparison. The cashew cookie was surprisingly moist, and reminded us of the texture of the chinese almond cookie. My favorite thing about the breakfast buffet at the Marriott Courtyard was the make your own waffles set up. The batter came out of a spout and you poured it in to the mini-waffle iron, flipped and waited. I cooked mine a little longer, hoping to have some crispy edges and they didn't turn out half bad.